Update: For our developer and sysadmin readers, we've added the enthusiast-favorite openSUSE to our list. Read on to number 8 to find out more! Linux is based on the Unix family of operating systems, which rose to fame in the late 1970s. It has been adopted by various software developers and turned into various 'distributions' or 'distros'. All of the top Linux distros use the Linux kernel, which can be thought of as the heart and soul of the operating system. The various desktop environments for these distros is then built around it. The latest version of Elementary OS is called Loki, which as well as being that bit prettier and neater than its predecessor Freya, has its own application installer UI called AppCenter. It’s a delightfully simple way to install apps outside the terminal, which is handy as there aren't very many preinstalled. You can download three main starter flavours of Mint 19, each of which uses a different desktop environment, the top-most layer of the interface allowing you to change elements such as the appearance of windows and menus. Cinnamon is currently the most popular, but you can also choose the more basic MATE, or Xfce. Linux Mint 18.3 was the last release to have an official KDE version. Unfortunately, this is no longer available with Linux Mint 19, but it can still be installed on top of version 19 if you miss it. While Timeshift was introduced in version 18.3 and to all Linux Mint releases, it is one of the main features of Linux Mint 19. Timeshift enables users to restore their computer from the last functional snapshot. Antergos’ graphical installer can guide you through the setup process and boot you to the Gnome 3 desktop environment. It can also use the Cinammon, MATE, KDE and Xfce environments if you prefer. Antergos doesn't come with an office suite but you can install this and other programs via the delightfully named Arch package manager ‘pacman’. Ubuntu is one of the most popular flavours of Linux and along with Mint is strongly recommended for Linux newbies, as it's extremely accessible. CentOS 7 is a community offshoot of the Enterprise version of Red Hat Linux, and its focus is on stability rather than constant updates. Like Red Hat, security and maintenance updates for CentOS are pushed out up to 10 years from the initial release of each version. CentOS is designed to be super-reliable, which is why it’s a great choice for a server. It's not quite such a good bet for someone looking for a new OS for daily use on their desktop PC or laptop. On the plus side, you can enjoy the pleasure of having something for nothing – packages compiled for the commercial version of Red Hat Linux are fully compatible with CentOS, so you can use them free of charge. If you want a home music recording studio or a video production workstation without spending the thousands of pounds involved with industry standard software, consider installing Ubuntu Studio. This officially recognised flavour of Ubuntu Linux has been designed for audio and video production, as an alternative to paid software such as Pro Tools. Support for audio plug-ins and MIDI input is built in and a virtual patch bay comes preinstalled. Ubuntu Studio’s repositories have access to the packages in the main Ubuntu OS as well as a few digital audio sequencers. Its main strength is in audio recording through tools like the JACK Audio Connection Kit. Previously known as SUSE Linux and subsequently SuSE Linux Professional, openSUSE is aimed at developers and system administrators. For that reason, it’s extremely stringent on security protocols. The operating system is divided into two main distributions: openSUSE Leap and openSUSE Tumbleweed. Leap uses the source code from SUSE Linux Enterprise, which makes it much more stable. New versions are released roughly once a year and are supported for three years, making Leap perfect for business applications. Tumbleweed (pictured above) is based on Factory, openSUSE's main development codebase. It follows a rolling release model – in other words, packages are made available for download as soon as they've been tested in Factory. This means Tumbleweed contains the latest stable applications and is good for day-to-day use. 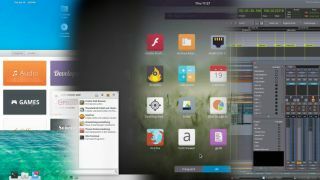 The OS makes uses of the shiny KDE Plasma desktop, which is perfect if your machine can handle the more advanced graphical features. One of the more polished Linux distros around, openSUSE is consistently ranked in the top five distros on DistroWatch.com. What’s more, the SUSE Studio Express website allows you to create your own version of openSUSE, complete with tailored preinstalled software packages, desktop and system settings.